Today’s giveaway is from Abacus Row, a handmade jewelry line based in San Francisco. The pieces are both delicate and vibrant and are so pretty for fall. I have the Draco necklace which I wear all the time (especially to dress up a plain white tee). Abacus Row is giving away the Auriga necklace—with a plum silk cord and gold and Labrador crystal beads—to one lucky winner. For a chance to win, please visit Abacus Row and like the Facebook page, then leave a comment with your favorite Abacus Row piece and your email address below. A winner will be chosen at random and notified on 11/13. Good luck! Update: Sarah D. is the winner. Thank you for entering! I'd have to say my favourite piece is the Auriga bracelet. Thank you for turning me onto this jewelry site. I love the Corvus necklace. Simple but elegant and very versatile. lisa at comeliketherain dot org. I love these! My favorite is the Pavo necklace. Love the orange. Pretty. I like the Indus Necklace! Great find, Sobrina! Love the Phoenix necklace. 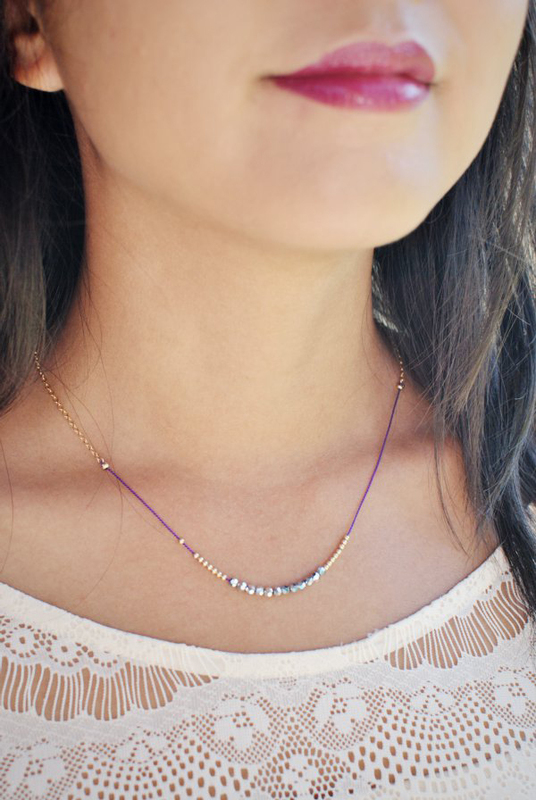 These necklaces are super delicate and add something subtle yet interesting to an outfit! I looooove the Carina necklace; it's so long and glittery. I really like that you can buy extra pockets for traveling with more pieces and keep them seperate. The Auriga necklace is suuper cute. I love the detail, and thread. Would love to wear it! Really beautiful and delicate collection! My fav is the Pavo necklace. The Draco necklace is so pretty. I love simple jewelry to dress up my casual jeans and teeshirt standby, just like you said. Thanks for the giveaway, Sobrina! 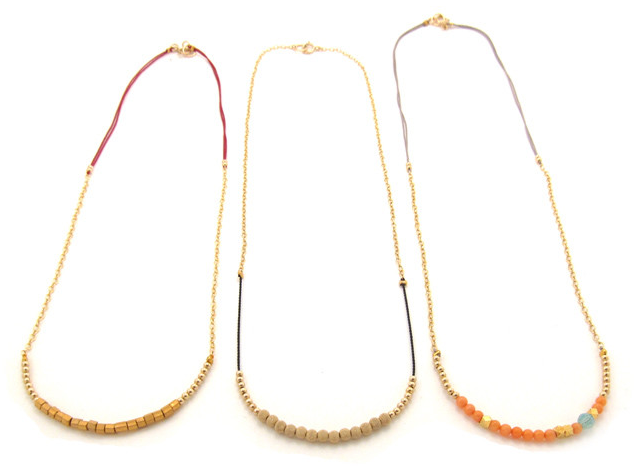 Such beautiful necklaces – so delicate and simplistic! My personal favorite s the Pavo necklace – the bright coral would be a great small splash of color to add to an outfit. My favorite necklace is the Vela Necklace. The color is beautiful. I love the Pavo Necklace! They are all so pretty! Favorite piece is Pavo necklace. These are lovely pieces…so hard to choose a favorite. But I guess I would go with the Draco Necklace! I love the Phoenix! Although it's different than the rest of the line, I think it's striking!